When you are making homemade ice cream one thing you can’t do is make soft serve. Unless you happen to have a soft serve machine, in which case you must have a dream kitchen or live in a Dairy Queen or a college campus. Tom has fond taste memories of the small chocolate cone from DQ and Kira remembers the glorious days of undergraduate dining facilities. On a NYC summer day, it seems that you can’t walk a block without hearing the dulcet tones of the Mister Softee’s song, but for the ice cream enthusiast the average ice cream truck doesn’t always cut it. Douglas Quint and Bryan Petroff started Big Gay Ice Cream to put their twist on the traditional soft serve. Big Gay Ice Cream started with a ice cream truck that could be spotted throughout New York in 2009, and opened their store in the East Village in 2011. Their store does something out of the ordinary for an ice cream shop…they actually sell other peoples frozen treats (Melt Bakery for example) in addition to their amazing menu of cones, sundaes, and milkshakes. We found ourselves in the East Village on Kira’s birthday last month, and tried to get one of the fabled Nutella and bacon ice cream sandwiches but since the maker of the Bacon Marmalade is no longer that was out of the question. We settled on the Monday Sundae: a nutella lined waffle cone with vanilla chocolate twist ice cream, dulce de leche drizzled over top with sea salt and whipped cream. It was reasonably priced for under $5 (as are most things on the menu), and more than enough for two people (we highly recommend sharing). They even serve this sundae cone in an ice cream condom- a little plastic sleeve that catches and protects your hands from the melting ice cream in the mid-summer heat . On our second visit we ordered American Globs. 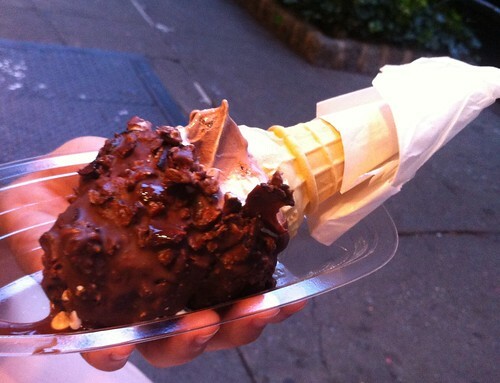 This is vanilla ice cream served in a more traditional cone rolled in pretzels & sea salt then dipped in chocolate. It had the perfect ratio of salt to sweet, soft to crunchy. We opted to get twist ice cream instead of plain vanilla, and it was an excellent decision. We are big fans of the twist. 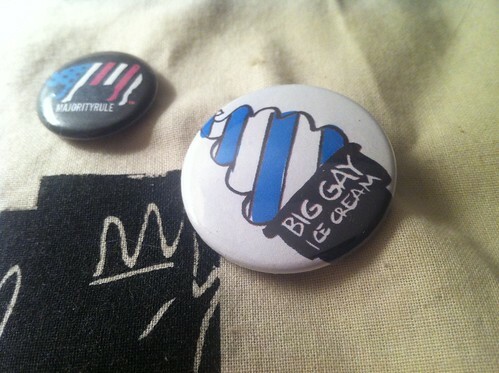 Big Gay Ice Cream is a must try for those who love the soft serve. It’s an updated version of a childhood favorite that will cool you down in ways Mister Softee and Dairy Queen never could. The storefront has no inside seating, with a single outdoor bench, but Thompkins Square park is just a block and half away. Their staff is truly enthusiastic about the product, which makes it easier to stand in the line that can stretch out the door. It’s the kind of business that makes people smile by serving a delicious dessert with a wink. This entry was posted in Reviews and tagged Big Gay Ice Cream, dairy queen, Mister Softee, Soft Serve, sundae, waffel cone by Tom. Bookmark the permalink.